You and I go way back. I’ve seen your employees move from store to store, get promotions, grow gray hair. Your reasonable prices on milk, bread and eggs keep me coming back (though for the life of me I don’t understand why the whole wheat pita gets moldy so fast). I was at a big meeting in South Los Angeles yesterday, and they’re trash talkin’ you down there. The meeting was about access to health care and health disparities in low income communities. Availability of healthy, inexpensive food is a big issue in those circles. Big supermarket chains do not build stores in South Los Angeles. Independent grocery stores have a hard time getting established there because the grocery workers union is against stores with non-union workers. South Los Angeles wants a Trader Joe’s. Bernard Parks says he called you up a few years back and you said something like, “We’ll never put a store in those zip codes because those zip codes make our Culver City store #1.” The CEO of Community Health Councils told a room full of people that she’s boycotted of you for the past two years (she admits you may not have noticed). South Los Angeles wants a Trader Joe’s. C’mon, you can do it. 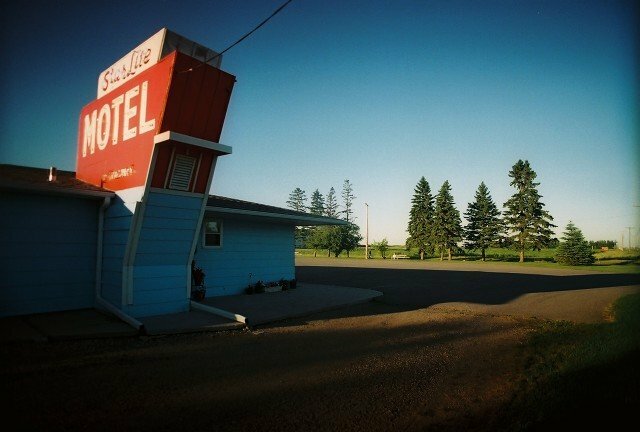 Star Lite Motel. Dilworth, Minnesota. It’s the birthday of poet Frank O’Hara, (books by this author) born in Baltimore, Maryland (1926). He wanted to be a pianist when he was growing up, but while he was a student at Harvard, he met the poets John Ashbery and Kenneth Koch, and they persuaded him to write poetry too. He moved to New York City in 1951. He got a job selling post cards at the Museum of Modern Art, and he slowly worked his way up to become one of the curators. He fell in love with the abstract art of the 1950s, and he believed that poems should be improvisational, like action paintings. At the height of his career, he wrote constantly and stuffed his poems into his desk drawers, often forgetting about them. This entry was posted on 27 June, 2008 at 10:29 am and is filed under Around Town, Let's Get Visual. You can follow any responses to this entry through the RSS 2.0 feed. You can leave a response, or trackback from your own site. Here is a bit of T Joe trivia. Once upon a time, the Hi-Ho market (down the street from the Church of Angels on Ave 64) was a Trader Joes. If you look carefully at the “Hi Ho” sign, you will see the smaller lettered “wine and cheese” at the bottom of the sign.